Penta people, the Pentominoes, always build their houses from five square rooms. I wonder how many different Penta homes you can create? Can you make these equilateral triangles fit together to cover the paper without any gaps between them? Can you tessellate isosceles triangles? 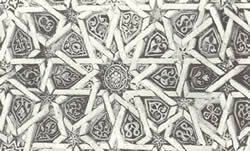 Below is a pattern which can be created using a pair of compasses and a ruler, and a photograph of an Islamic Star. Use the interactivity to make this Islamic star and cross design. regular octagons with two different types of triangle? irregular hexagons with triangles and squares? Click on a region of the pattern to change its colour. The colours will cycle between white, green, purple and orange if you keep clicking. Use the CLEAR button to change everything back to white. Games. Tangram. Practical Activity. Compound transformations. 2D shapes and their properties. Interactivities. Working systematically. Tessellations. Regular polygons and circles. Visualising.